Submitted by Richard Arguile on Tue, 2015-03-17 17:17. Normally dead bodies in a graveyard are buried—but not this one. When a woman is found strangled in a North London cemetery with an old newspaper clipping clutched in her hand, Inspector Witherspoon is surprised to find that he and the victim have crossed paths before. Alice Robinson was a respectable widow who ran a quiet Islington lodging house. None of her lodgers have any apparent motive to murder their landlady. But nagging suspicions are lodging in the Inspector’s mind—only he knows that “Alice Robinson” is not her real name. 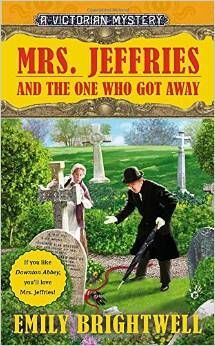 Now he’ll need the help of Mrs. Jeffries to revisit an old case that has haunted him for years and to get the real story.